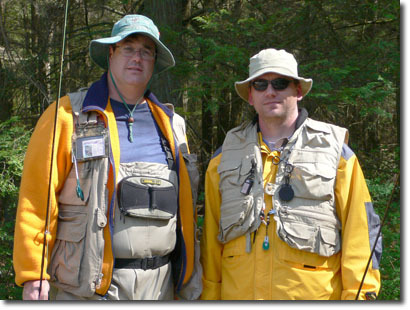 My good friend John called me one day in 2005 and asked if I'd like to learn Fly Fishing. It seems he had a pre-paid class for two and the other person backed out at the last minute. I agreed and the rest, as they say, is history. Fly fishing is a whole lot of fun for reasons that escaped me until I tried. The easiest way to explain it is that bait fishing is like trapping where fly fishing is more like hunting. When fly fishing, the goal is to out-think the trout, which is surprisingly difficult! What fishing is really about - Nerds with funny hats!